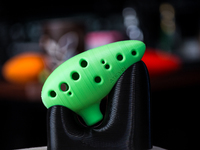 Single Print Ocarina by 3E8 is licensed under the Creative Commons - Attribution - Share Alike license. 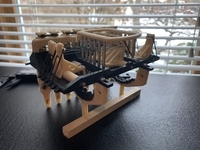 This beautiful item took a lot of experimentation (and a ton of ABS) to get right... but the final product produces a full octave and then some! 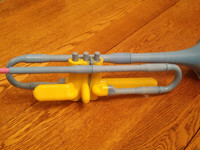 No gluing parts together or tuning - just print and play! The latest 60 degree tone hole version goes from a gentle 311 Hz to a crisp 846 Hz. Enjoy! If you print this, please kindly click "I Made One" and share pictures and videos! I love that stuff! February 2nd, 2016 update: added a V3 with new tone hole which functions a little better! Sept 11th, 2016 update: modified the tone hole a touch so that you can blow more firmly at higher notes (all holes open) and it makes a good solid sound. When all holes are covered, you'll need to blow more lightly. Dec 21st, 2016 update: Fixed the mid-seam issue that some printers that use a layer height of .2mm or less may experience. 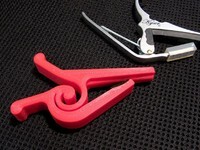 No supports necessary, just print as is, where is. I used 10% infill for all of the ones I've ever printed, however you'd probably end up with the sharpest sound if you went 100% (and added acetone vapor treatment). Nonetheless, it plays right off the build plate.